The Fellowship was fortunate enough to obtain a copy of HELLBOY AND THE BPRD 1952 #1 from Dark Horse Comics. Mike Mignola and John Arcudi write, Alex Maleev draws and Dave Stewart colors. Hellboy might be young, but he’s already fully grown (or thereabouts). He’s also bored out of his skull cooped up at BPRD headquarters. The Professor knows that the only way he’s going to learn anything now is out in the field. His first assignment takes him to Brazil in search of a “supernatural” killer. The villagers are freaked out, to be sure, but something else is going on. I think this is an interesting time to set a Hellboy prequel (I hope that term doesn’t offend). It’s the beginning of the Cold War, and Red is young enough to be impressionable but the right age to start developing his attitude. The team of agents he’s working with is a diverse group too. The art is, as always, a character of its own; I love how it uses darkness in particular. A young Hellboy learning the ropes should prove to be a source of stories for a long time to come. And this is a great jumping-on point for new readers. 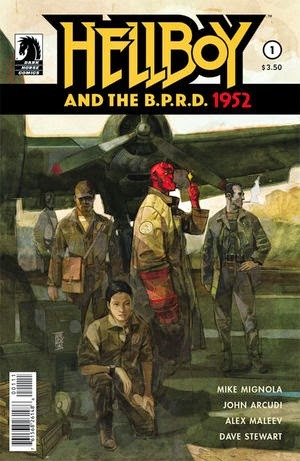 HELLBOY AND THE BPRD 1952 #1 is available now at your FLCS or at darkhorse.com.